"This is Layney, shown here at 8 months old. She is a Cocker Spaniel / Maltese mix. Her father was a Cocker Spaniel and mom was a Maltese. She has the instincts of a Cocker Spaniel. She loves to be outside hunting anything that flies. We can't keep her away from water, puddles to creeks, ponds and lakes, but she has all the maintenance of a Maltese and is the happiest dog I have ever owned or been around. She looks nothing like her littermates; they were multi- colored. She has very different traits. She has way more energy than I imagined when my wife brought her home, but not as much energy as our Jack Russell has. I have researched her mixed breed and have never seen another dog that looks like her. 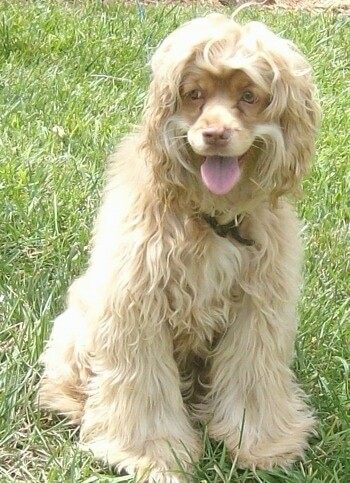 At first glance, people instantly think she is a Cocker Spaniel, but up close they ask what breed she is"
The Silky Cocker is not a purebred dog. 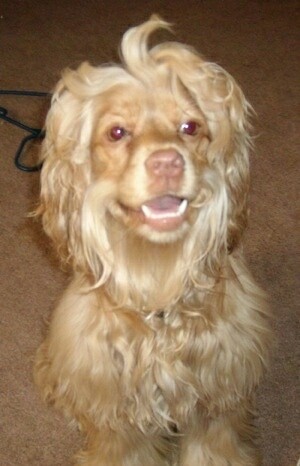 It is a cross between the Maltese and the Cocker Spaniel. The best way to determine the temperament of a mixed breed is to look up all breeds in the cross and know you can get any combination of any of the characteristics found in either breed. Not all of these designer hybrid dogs being bred are 50 purebred to 50% purebred. It is very common for breeders to breed multi-generation crosses. "This is Miranda. She is a Maltese / Cocker Spaniel mix. She's a year old and weighs 11 lbs. She is by far the best dog I've ever had. She's playful, yet a very calm dog, and was so easy to train. She's very smart. She loves toys, especially getting new ones, and has this toy bear she drags around the house; it's very cute. My sister has her sister and they play together often, it's adorable! I take her to my grandpa’s retirement home once a week and everyone loves her. I even think my grandpa’s more excited to see her than he is me. She's a lot of fun and has so much personality, she wants to do everything with me—if I'm lying on the couch she is too, cuddled up right on me until I get up then she follows me everywhere. She's the perfect mix breed and the perfect companion for me!"